Snap! It’s December 2015 and it’s absolutely freezing. Najib on the other hand isn’t having anything of it. The week before, he’s rocking in a summer jersey, arm warmers, and mitts. He admits later that he is cold, but his feet are not, and are actually very happy. On a day like this, I’d like my feet to be happy also. Najib is wearing what can only be described as ‘rubbers for your feet’. A pair of giant-condoms, you could say, or to put it more appropriately, verruca socks; you know, the ones they made you wear when swimming. It’s one of those ‘why didn’t I think of that’ moments. 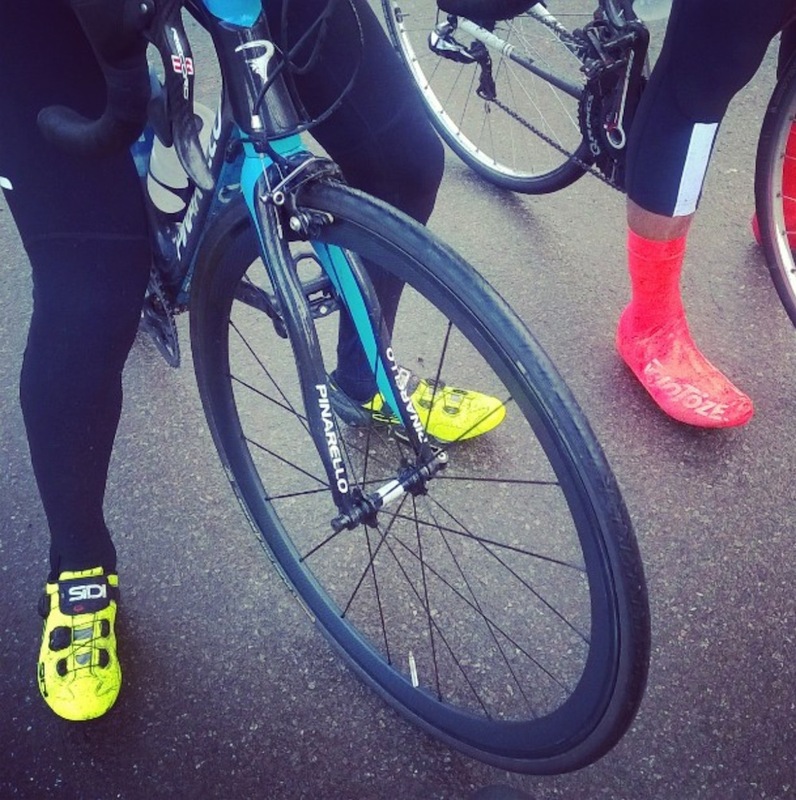 Najib reveals to me that these groovy overshoes are made by a friend and that they should be widely available soon. Their name, Velotoze – we did a quick look under our ‘wish list’ category, with videos on ‘Bootie Power’ back in January. Several months later, and as we quickly approach the cooler seasons, we can now bring you a review. As you can imagine, it does very well at keeping water and muck out. The fabric and fit makes sure of that. The latex-rubber ensures that as long as you keep moving, the energy created continues to heat up your feet. So any prolonged absence of movement will eventually let the chill return. It’s not totally waterproof mind; deep puddles and the heaviest of rains will find their way through the heel and cleat holes below. However, this only happens in the most horrid of rides. 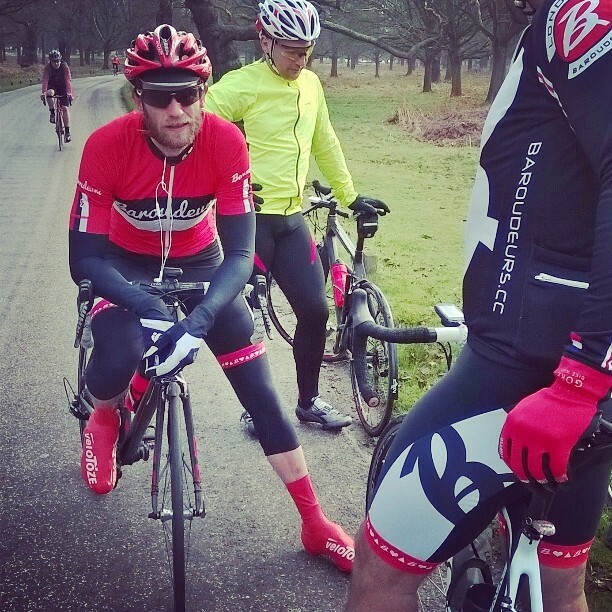 Fellow Baroudeur, Daddy-Cool (DC) coincidently rocks up on a ride with same pair a month later. It’s always good to get someone else’s objective view; someone you know won’t mince words or throw-away niceties, and equally important, to see how they look. I’m hoping they look just as good as they do with Mr. Coolness here. DC’s first impression is that they work, but you’ve got to be prepared to take a moment of learning the technique of getting them on. The trick is not to rush the process, but rather, follow the simple steps to putting them on and taking them off. There are some obvious problems to this otherwise promising concept. First and foremost is the material’s vulnerability to tearing. On my very first outing, a pierce, which I can only presume came from a stray pebble on the otherwise smooth pavement, tore a very small hole into the base of the bootie. As a result, by the time I got home and removed the overshoe, whilst carefully following their instructions, the hole was now the size of the base of my shoe. Clearly, this limits the product to either track, or careful riding on good roads only. 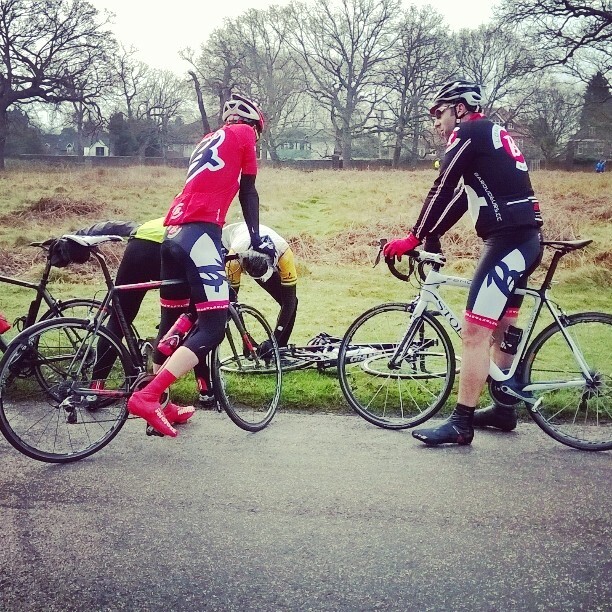 Don’t even think of going behind that bush for a ‘natural break’, thinking your new overshoes won’t go unscathed. 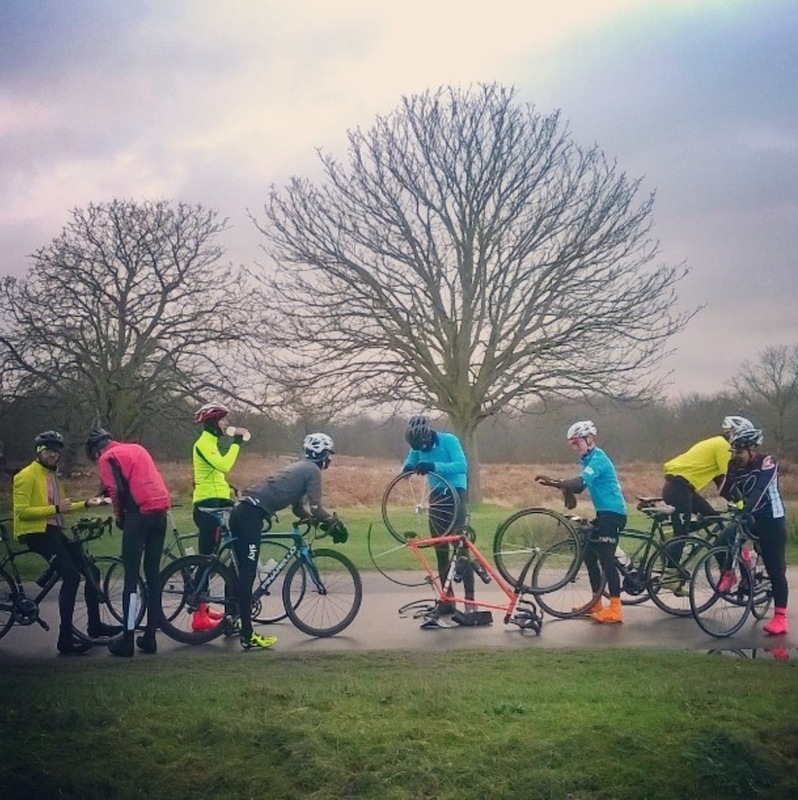 You’ve also got to be clued up to how warm, or cold, you ride. 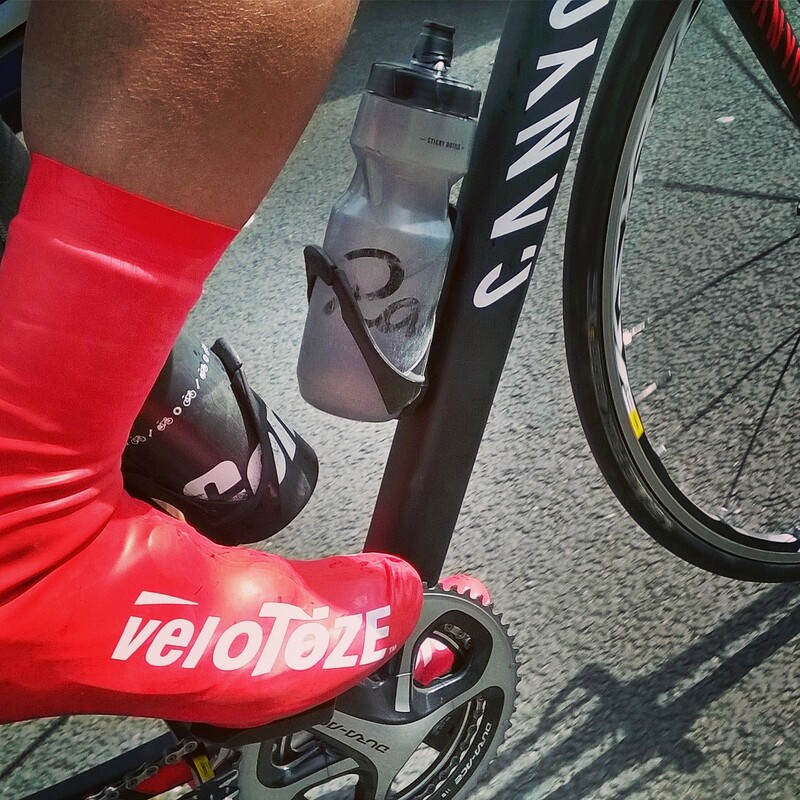 If it’s just mild, you’re probably better off with a overshoe by the likes of DeFeet. 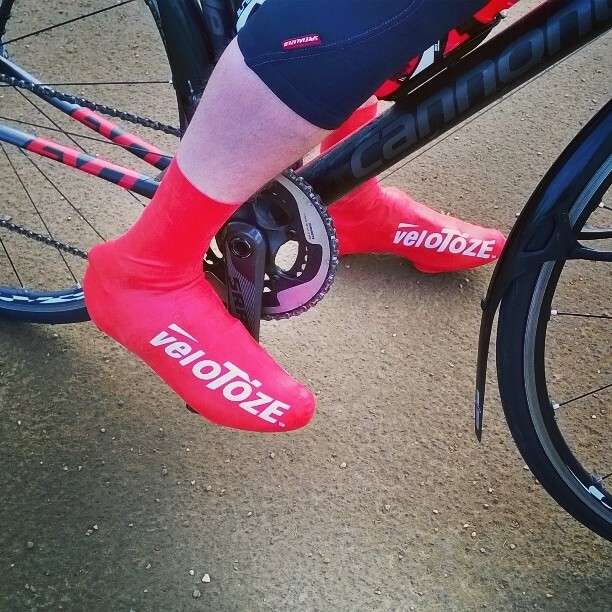 Only if the temperature hits below 5 degrees and/or is pelting it do the Velotoze come into their own. True, it being Great Britain, these are conditions we face often. Overall this is an overshoe with a lot going for it. It’s a straightforward concept that we know will work, but work under limited conditions. Still, these are conditions which you are very much in control of, but if you like being unlimited in your adventures, the more traditional alternatives may still prove to be the ones to go for. Other reviews mention similar problems, as listed above, but it seems that Velotoze are happy to replace your purchase with no questions asked. I have yet to test this, and if I can find my receipt, I hope to do this soon. These overshoes were not provided by the manufacturer, but purchased from Sigma Sport in Kingston. Various colours and lengths are currently available, starting from £12.99 for the low-cut, and £14.99 for the high-cut.